Act! software was developed by Symantec and later acquired by Sage Software. The database structure was significantly changed in recent Act! versions. Old Act! versions keep all user and password information in a file of .blb file type. It is possible to extract user names and passwords instantly. In the new Act! version SQL database is used. Passwords are no longer stored in the database, so there is no way to extract them instantly. Universal recovery methods such as Brute Force Attack or Dictionary Search are required. This may take a lot of time. 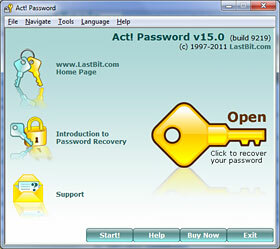 You can use Password Calculator to estimate recovery time. Fortunately it is possible to reset the password to a known one instantly. However the original password will remain unknown. 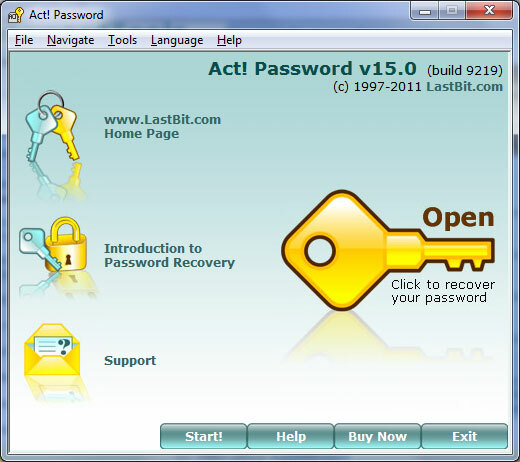 Due to a security flaw in the encryption scheme used in Act!, it is possible to recover passwords simultaneously for all users.